The musical is on October 29. 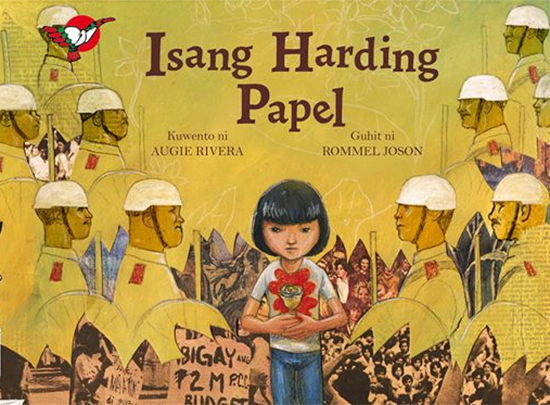 (SPOT.ph) Learning history is important, but human rights violations, famine, and graft and corruption during the Martial Law period under former President Ferdinand Marcos may be too morbid to explain in detail to the young ones. How exactly can you narrate to an eight-year old that the Russian roulette is not a game but one of the types of torture that people underwent during the dictatorship? But truth must prevail and history needs to be passed on from one generation to the next in order to avoid committing the same mistakes. 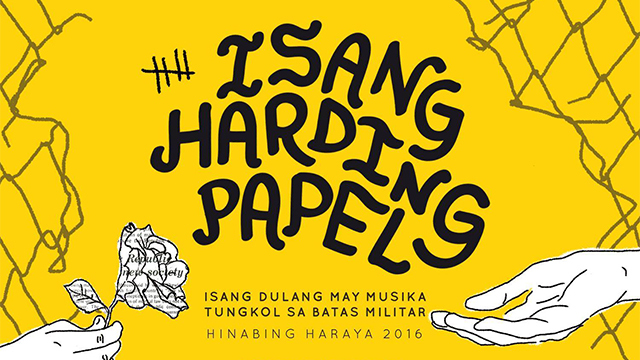 With this in mind, the progressive Raya School Manila in Quezon City presents Isang Harding Papel, a musical adapted from Augie Rivera's children's book of the same name published in 2014, on October 29 at the Marian Auditorium of Miriam College. 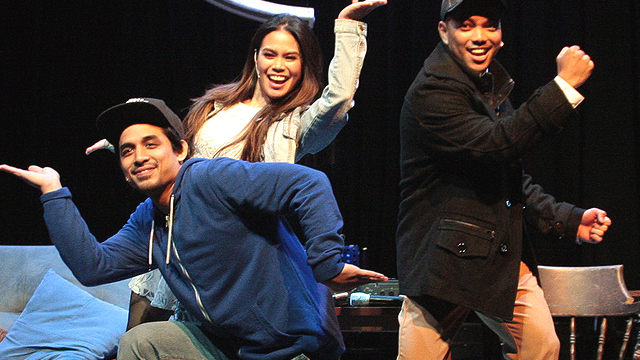 It is written for the stage by award-winning writer Nanoy Rafael with original music by Thea Tolentino and directed by Abner Delina Jr.
Isang Harding Papel follows Jenny, who patiently waits for her mother to come home while making flowers from paper. Set in the time of Martial Law in the Philippines, the story also reminds people of certain common, but questionable things from that period, such as the nutribun, a supposedly nutritious bread made with ingredients donated by the U.S. usually given to public school children. The production is part of the school's Hinabing Haraya, an annual fair which showcases locally published children's books through a stage adaptation. It is attended by 500 people, mostly grade school students in Metro Manila, parents from Raya School, and other supporters of children’s theater. 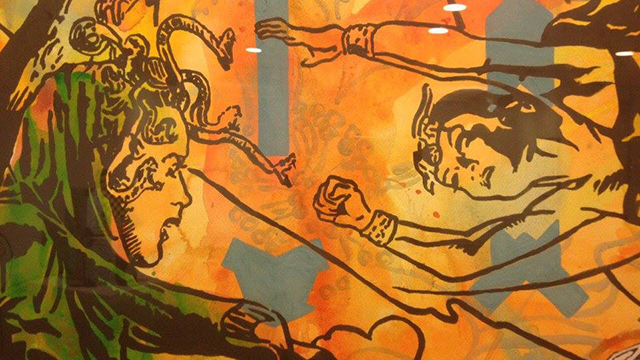 The Raya School Manila is the laboratory school of Adarna House, publisher of educational children's books. 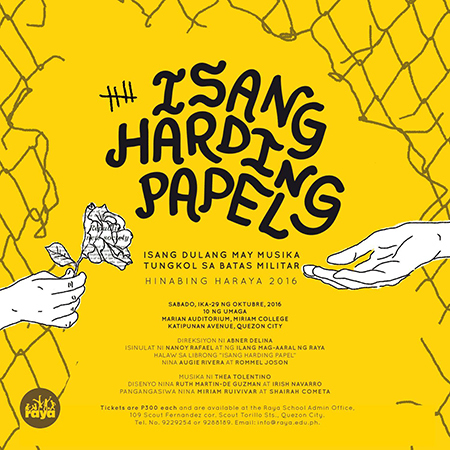 Isang Harding Papel is on October 29, 10 a.m. at the Marian Auditorium, Miriam College, Katipunan Avenue, Quezon City. Tickets, priced at P300, are available at the Raya School Admin Office, 109 Scout Fernandez corner Scout Torillo, Quezon City. For more information, e-mail info@raya.edu.ph or call 928-8189.